The CBI Magnum Force 5400SE-SA is recognized as a world champion of extreme duty stationary Hogs. With its exceptional strong yet light chassis the 5400SE-SA delivers the rugged durability needed for grinding pallets, construction and demolition (C&D), storm debris, slash, dunnage and much more! The 14′ long and 48″ wide feed conveyor has a fluted high troughing design which provides optimal feed to the hog chamber. The open-ended design and large capacity allows for ease of feeding full length material. 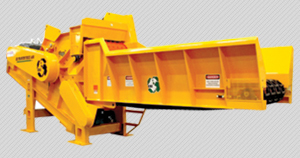 A dual upper-lower feed roll system affords continuous, positive feed for bulky materials. The hog box is a heavily reinforced tank with bolt-on AR 450 wear liners that extend the box life and simplify maintenance. The rotor is driven by a crusher duty style electric motor. The 2 1/2″ thick anvil and 1 1/4″thick grate liner are AR 450 plate. This machine can be adapted to accept any style of CBI rotor (steel segmented, forged drum or chipper drum) for the ultimate in flexibility, versatility and durability!